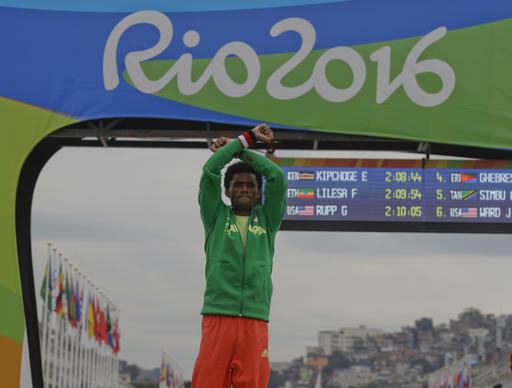 Feyisa Lilesa could not stay silent, not with the finish line in sight and an Olympic stage to amplify his message. 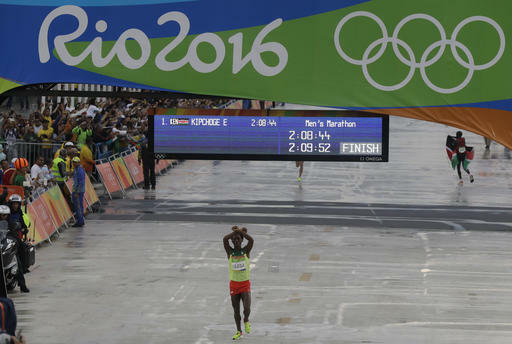 So the Ethiopian crossed his wrists above his head Sunday as he approached the end of the marathon at the Rio Games with the silver medal awaiting him, making the symbol of anti-government protests. He crossed his wrists over and over trying to bring to the world's attention what is going on in his country. "The Ethiopian government are killing the Oromo people and taking their land and resources so the Oromo people are protesting and I support the protest as I am Oromo,'' Lilesa said. "The Ethiopian government is killing my people so I stand with all protests anywhere as Oromo is my tribe. My relatives are in prison and if they talk about democratic rights they are killed. I raised my hands to support with the Oromo protest." Lilesa crossed his wrists over his head during the gift ceremony after the race and again and again during the news conference where questions about his protest overshadowed the gold-medal victory by Eliud Kipchoge and the bronze won by American Galen Rupp in just his second marathon ever. The long-distance runner knows his life could be at risk if he returns to Ethiopia. He also knows his protest at the 2016 Olympics could draw sanction from the IOC. "I cannot do anything about that,'' Lilesa said. "This was my feeling. I have a big problem in my country, it is very dangerous to make protest in my country." If you're wondering why #Ethiopia medalist #FeyisaLilesa is crossing his arms in protest at #Rio2016, then follow #OromoProtests. Powerful. The state broadcastser in Ethiopia refrained from broadcasting video of Lilesa's protest and chose only to show Kipchoge of Kenya's finish time.